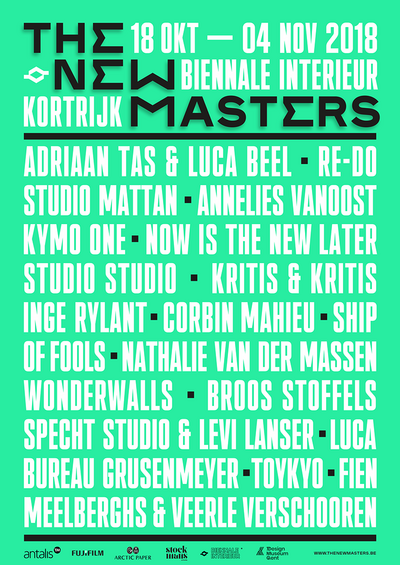 Flanders DC - The 20 best things at the Interieur Design Biennial! Home Magazine The 20 best things at the Interieur Design Biennial! Flanders DC was of course in the mix at last week’s Interieur Design Biennial in Kortrijk. What did we think of it? And was there anything new on the Belgian manufacturing scene? Find out for yourself in this summary. The Interieur Kortrijk exhibition underwent a total metamorphosis this year. It no longer lasts for ten days, but has been trimmed to five. The floor area is smaller too, and the halls were a good size with spacious aisles. Visitor turn-out was good, but we will probably never see the massive crowds that we used to see, twenty years ago, on an exhibition Sunday. Bank Delen made a very good job of the opening ceremony, and their presence at the exhibition was unmistakeable. Once again, the The Floor is Yours section for young designers was housed at a single location, the Rambla. Conceived as a compromise, the Landmarks selection was intended to showcase designers who are neither new to the business nor among the 'design greats'. Unfortunately, this didn’t always come across consistently. This edition’s off section was hosted in the former Sint-Maarten hospital. 1. Frederik Delbart was introduced as Designer of the Year at Interieur. Delbart, who is currently the art director at Recor Home in Hasselt, is employed in a strategic capacity by door handle manufacturer Quincalux and has designed for the likes of Aluci, Ars Fabricandi, Van Den Weghe Items, Moome and PER/USE. 2. Glenn Marys studied interior design at the KASK in Ghent and followed the VOMO furniture design course in Mechelen. He is the in-house designer for TossB, for which he designed the Round Control collection this year. 3. Iona Tettelin and Jan De Man, a couple of VOMO furniture design students from Thomas More university college, were scouted by Movecho at Interieur 2016. They were offered internships in Portugal. Movecho has returned to Interieur 2018, two years later, to launch a stool designed by Iona and a desk designed by Jan.
4. Reflections is the collective name given to three new Delta Light collections. Delta Light aims to create the best possible relationship between architecture and interior, the people who use them and the exhibition visitors. Reflections is a poetic expression of craftsmanship, light, technology, texture, shape and atmosphere. 5. The MMooD design label was created in 2014 and refers to the origins of the company Mintjens Masters in WOOD. For MMooD Benoît Deneufbourg designed an elegant desk for the smaller living space. In its open position FLAP is a compact and functional desk, best suited to laptop users. When closed it serves as a handy magazine rack or an ideal storage unit. 6. LOOP is a modern-day take on an art deco lamp. The pivoting vertical element, made from wood or marble, contains a copper coloured ring which holds a bulb. The beautifully curved power cable is a visible element of the design. LOOP was designed by Filip Janssens for PER/USE. 7. MAD Brussels and Flanders DC came together as Belgium is Design to present nine young designers from Brussels and Flanders at a group stand. The stand was designed by Isabelle Speybrouck. The photo shows the work of Laure Kasiers (carpets), Filip Verbraken (coffee table) and Nathalie Van Der Massen (linen fabrics). 8. There were also a few installations to be seen in Landmarks. Conrad Willems is a visual artist and designer from Ghent who concentrates on sculpture. He used architectural elements to build Constructions. Building is a performance art, as he sees it. 9. In 2015 Rico Bel began working on Barh, a start-up which was launched at Interieur. Jeroen Thys Van Den Oudenaerde is the art director, Sam Goyvaerts one of the designers. arch|01 and brut|01 were designed by Sam, cube|01 by the Barh team as a whole. 10. The story of the Sintese Eco began in 2013, with Thomas Litière, who developed an eco-efficient version of the Sintese. Frank Goethijn and Dirk Van Gogh promoted the project and maintained ties with Indera. The sofa has now been designed for complete re-use, re-upholstery and recycling. The new business model involves a corporate leasing system, which shifts the emphasis from product ownership to product use. 11. Roel Haagdoren’s grandfather made furniture for a living. It was from his grandfather that he inherited his love of craftsmanship and feel for materials. Roel experiments with geometric shapes and proportions. He plays with balance, ratios and proportions of materials. This process yielded the Push collection. 12. The guys at Piraat are good with their hands. Raf Vaerewyck and Pieter Van Snick love to develop their ideas from custom designs and have no preconceptions about the materials, as long as they are genuine, aesthetically responsible and of impeccable quality. 13. Sol by Bultin in Ghent is a vase, available in polycarbonate or travertine. The object celebrates the individual flower, rather than the bouquet. Sol has also been nominated for the Interieur Awards. 14. Luminello manufactures high-end indoor and outdoor lighting in stainless steel, copper and glass. As everything is made by hand, the diameters, finishes and colours of the designs can be altered. 15. Bram Kerkhofs and SCMP Design Office won the Interieur Award for Objects. Bram’s Coil had already been exhibited at the BAD design fair and Design September. Sylvie Van de Wallewas given an honorary mention for Pontius. Who’s washing their hands of guilt? 16. Most memorable among the Interieur Awards for Spaces were Café Gyproc by Julien Renault and the Swede Paul Vaugoyeau. When imperfection is a thing of sheer perfection: a simple but classy southern bistro. The awnings are made from Kvadrat fabrics. 17. Once again, the best student projects from the creative design schools were presented in Design Week. These projects were displayed in the former Sint-Maarten hospital in an exhibition entitled The Next Generation. 18. Sabine Marcelis has roots in the Netherlands and New Zealand. She is currently working in Rotterdam. Her work lies somewhere between art installation and functional design. Her use of colour and materials is striking. The Victor Hunt gallery exhibits her work in Belgium. 19. To mark fifty years of the Interieur exhibition, DIFT invited a number of designers to take their inspiration from Interior’s archives and those of the Ghent Design Museum. This resulted in The New Masters. Many based their ideas on older designs by Boudewijn Delaere. It was difficult to pick an outright winner, so we show here a poster by Broos Stoffels, with typography inspired by the Interieur logo. 20. Wilde Westen, a partnership of concert organisers in the region of Courtrai, curated the SOUND ART TO OBJECT expo (#KlinkendeStad) at the Interieur Festival. Sound artists from home and abroad combined sounds and material objects to create a series of sound objects. The Frenchman Stephane Kozik presented a brilliant Digital Breakfast. Vibrant Matter by Els Viaene was inspired by Icelandic glaciers and the slow movements beneath the surface.